Dorothy Watson is a Research Professor at the Economic and Social Research Institute. She received a Bachelor’s degree in Social Science from University College Cork; and her MSc and PhD (both in sociology) from the University of Wisconsin, Madison. 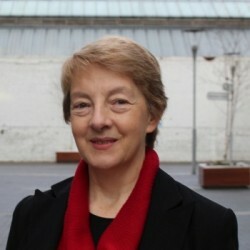 Dorothy took over as joint Principal Investigator of Growing Up in Ireland in July 2018. In her capacity as ESRI surveys expert, she has also managed several large-scale national surveys (including the longitudinal ECHP survey in Ireland and SLÁN 2007), she has selected Irish samples for high quality surveys such as the European Social Survey (ESS), the School Leaver’s Surveys (SLS) and the Irish Longitudinal Survey on Ageing (TILDA). Her substantive research has focused on social inclusion, equality and quality of life. Her recent research has examined the impact of the recession on economic vulnerability and the consequences for children’s socio-emotional development. Read more about Dorothy’s publications and work at the ESRI here.